House Majority Whip Steve Scalise of Louisiana (left) and House Majority Leader Kevin McCarthy of California are running to keep their leadership jobs when Republicans move to the minority next year. 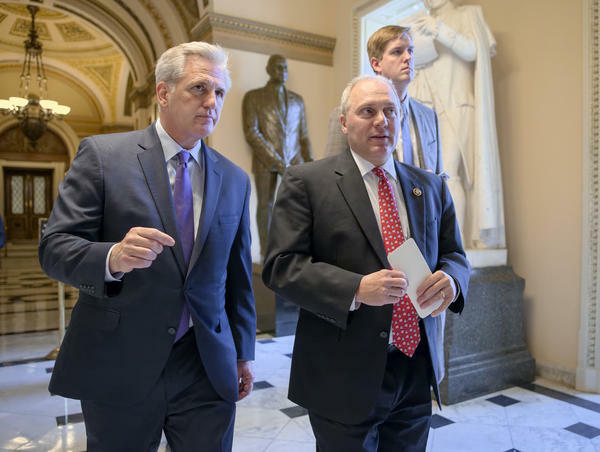 House Majority Leader Kevin McCarthy of California (left) and House Majority Whip Steve Scalise of Louisiana were both re-elected to leadership positions for the next Congress, but this time, they'll be in the minority. Much of the tension in the fight over who would replace retiring House Speaker Paul Ryan, R-Wis., deflated after Republicans lost more than 30 seats in the midterm elections last week, flipping control of the chamber to the Democrats in January. Only two of the current GOP leaders ran for top slots in the minority next year, and only one of those jobs was contested. House Majority Leader Kevin McCarthy, R-Calif., easily fended off a challenge from Ohio conservative Jim Jordan in a vote of 159-43, despite the party's heavy losses in the midterms. McCarthy positioned himself as the best choice for Republicans as Democrats try to dismantle their legislative achievements and investigate President Trump. "I think we stick to our principles, stick to our goals and you'll see this party continue to grow," McCarthy said in his pitch to members. "Watch out for us in two years. We'll be back." Jordan is the former chairman of the House Freedom Caucus, a group of roughly 40 House GOP members on the right flank of the conference. Jordan boasted support from some conservative outside advocacy groups. He ran on a platform of playing offense against Democrats as they launch investigations into Trump and his administration. "I think we're entering a world we haven't really seen," Jordan said ahead of the vote. "I think it's going to take an attitude and an intensity about standing up for the truth and fighting." McCarthy adopted some of the same messaging. He told reporters that he will work with Democrats when he can, but not if it means a singular focus on investigating the president. "Let me be very clear," McCarthy said. "If their agenda is simply investigations, impeachment and not focused on the hardworking American public, we'll be there to defend the American public." Democrats have largely avoided discussing impeachment and say investigations will be one part of their agenda going forward. They also plan to focus on health care and the economic opportunity, two issues that were at the heart of their campaign pitches across the country. It will be difficult for Republicans to stand in the way of those plans. The job of official party leaders changes dramatically from the majority to the minority. Unlike in the majority, where leaders set the agenda, the minority leader has to keep up party morale despite having very little power over the day-to-day operations inside the Capitol. Top GOP leaders will also lose their ability to offer amendments on key bills or other enticements to urge rank and file to stay united behind the leadership's message. The job will be even more complicated next year when Democrats launch investigations into the president, his family businesses and his administration. Instead, the GOP leadership will have to manage the strategy for those committee members who will be forced to participate in the investigations — on top of pressure from the White House to protect the president. And conservatives are making an aggressive push for greater control in the House, according to several Republican members and aides who were granted anonymity to discuss internal GOP negotiations. Jordan is expected to run for chairman of the influential House Judiciary Committee. Current Freedom Caucus Chairman Mark Meadows, R-N.C., is also expected to make a bid for a slot on the House Oversight and Government Reform Committee. Other top Republicans won leadership slots without a challenge. 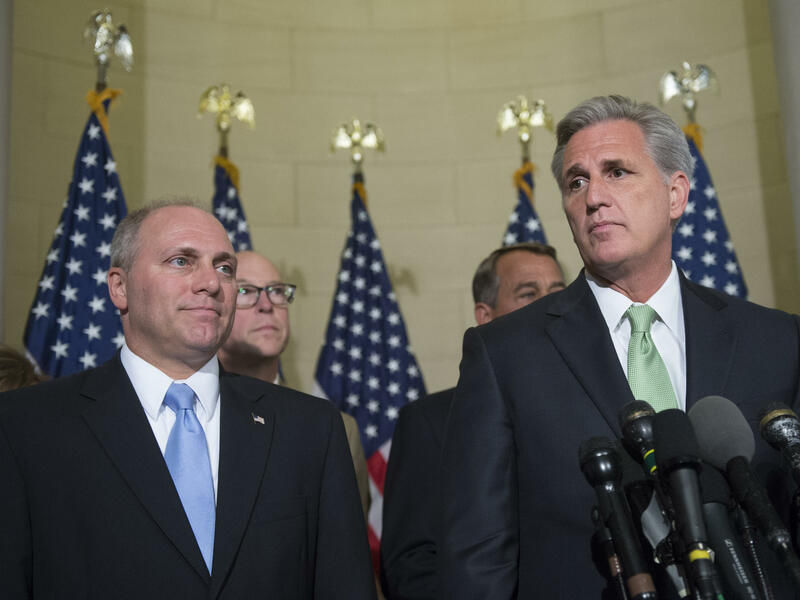 Whip Steve Scalise, R-La., was re-elected to remain the top GOP vote counter next year. He is well-liked among Republicans and rose to national prominence last year after he was shot and seriously injured at a GOP baseball practice in Virginia. Scalise forged a close bond with his colleagues and Trump during his recovery and worked hard after Ryan's retirement announcement to raise money and stump for Republican candidates. Wyoming Republican Liz Cheney also won her uncontested bid for House GOP conference chair. The No. 3 leadership slot is typically in charge of messaging and acting as a liaison between leadership and rank-and-file members. Cheney said she will focus on retaking the majority in 2020 by going on offense against Democrats. "We've got to be in a position where we're out there every day fighting," Cheney said. "We need to make sure we have a more aggressive approach, especially because we're in the minority." House Democrats will elect their nominee to serve as speaker of the House and other top leadership positions for the next session when they officially take the majority later this month. Senate Republicans retained their narrow majority in the midterms and unanimously re-elected Senate Majority Leader Mitch McConnell, R-Ky., on Wednesday morning to another term in his post. Senate Democrats similarly backed Sen. Chuck Schumer, D-N.Y. to retain his job as the Senate minority leader. House Republicans lost more than 30 seats in last week's election. It was a huge blow that cost them the majority after eight years in power. Today, they came back to Washington and re-elected some of the same people who led the party to defeat. Current House Majority Leader Kevin McCarthy will be minority leader next year. And McCarthy says Republicans in the House will work with Democrats when they can, but not if all they want to do is investigate the president. KEVIN MCCARTHY: We're going to have to work harder. I think our message is going to have to be clearer. Our ideas are going to have to be stronger. SHAPIRO: He also pledged to win back the House for Republicans in 2020. NPR's Kelsey Snell has been covering this and is here with us now. Hi, Kelsey. SHAPIRO: Why are things staying the same after such a big loss? Often there's a shakeup. Were there people challenging the sitting leaders to replace them? SNELL: ...They had to beg him to take the job. And McCarthy's kind of been waiting in the wings for the top leadership position. But this is a really divided Republican Party, and they were hard to manage back when they had the majority. And they're - it's (laughter) really just not very much fun to be in the minority when you can't set the schedule. And, you know, it's just a really tough time to be a leader. SHAPIRO: Is there any consensus among Republicans about who's to blame for their losses? SNELL: McCarthy was asked about this specifically a couple of times. And he said Republicans essentially had real problems in the suburbs. But he doesn't blame the Republican message, what - and the way they talked about taxes or health care or President Trump's approval ratings. He says he blames big spending from outside groups and donors like former New York mayor Michael Bloomberg. And he also blamed history. The - he says that the party in the control of the White House usually loses seats in a midterm. And he says that's what happened. He was also asked if he was worried about how the losses would, you know, make it harder for the GOP to recover. And here's what he said. MCCARTHY: I think we stick to our principles, stick to our goals. You'll see this party continue to grow and be the majority that represents all of America, in gender, in face, reality. We have a - room cut out for us. And watch us in two years. We'll be back. SHAPIRO: So he talks about being more representative in terms of race and gender. But when you look at a photo of all the incoming freshmen, the Republicans are very white and very male. And the party's representation in Congress has only been getting more so over the years. How are they planning to address this? SNELL: Yeah. It is very, very stark this year. Democrats did elect a much more diverse freshman class that's coming in, particularly in the House. Now, Republicans did make some moves to bring women into, you know, more leadership positions. They lost Cathy McMorris Rodgers, who was in leadership. She won re-election but chose not to stay in leadership. And she's being replaced by Liz Cheney. She's now the head of the House GOP Conference in charge of messaging. And she says she's ready to be more proactive and more aggressive in countering Democrats. She also says Republicans need to pitch that their policies are right for everyone, not just women. LIZ CHENEY: We shouldn't act like women are all going to, you know, go in one direction because we're women. I think at the end of the day, our policies are the ones that help give opportunity to everybody. SNELL: And she talked a lot about that, just about how Republicans need to be prepared to talk more about why they're right for people. And I should say, over in the Senate, Republicans also added women to their leadership ranks. Joni Ernst is now on the team over there. SHAPIRO: Any other leadership changes on the Senate side? SNELL: No, not really (laughter). Democrats and Republicans both had their elections over there today. And basically, everybody was re-elected. Mitch McConnell and Chuck Schumer still have their same jobs. SHAPIRO: ...I know we could spend a lot of time talking about the House Democrats, but leadership fight to come there? SNELL: Yeah. Things'll get interesting the week after Thanksgiving. And Nancy Pelosi is still fighting to be the speaker of the House. SHAPIRO: It's NPR's Kelsey Snell. Thank you, Kelsey. (SOUNDBITE OF HAUSCHKA'S "TRAFFIC") Transcript provided by NPR, Copyright NPR.